Prepare the floor and the wall before installing the bathtub. The corner meant for the bathtub installation should be at a straight angle, same as the floor in relation to the wall. All communications on the spot of bath installation should not obstruct bath legs and the bath itself. If a bath is equipped with a water faucet, then it is necessary to mount hot and cold water outlets with a thread of ½’’ under the bath. 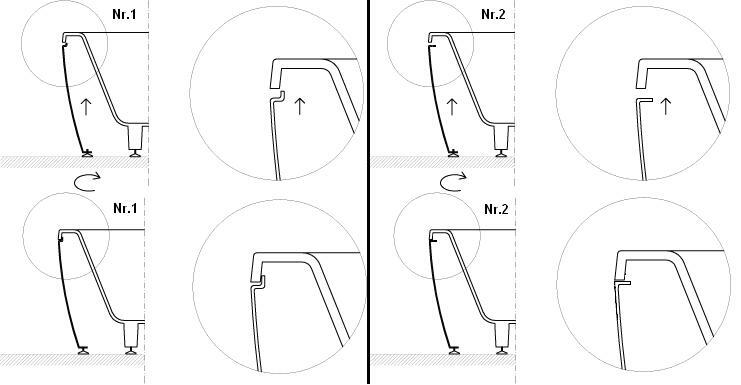 If the bathtub is to be placed in an niche, then the following requirements need to be met: the niche length needs to be at least 5 mm larger than the lenght of the bathtub. Otherwise when the bathtub thermally expands while filling it with hot water, it may become deformed and fracture. Remove protective wooden discs from the base of the feet which are necessary for safe transportation. Attach the legs of the bathtub. Measure height of the decorative panel (legs of the decorative panel should be completely screwn in). Arrange the bath in the place chosen. Adjust the height of the bath so that the gap between the edges of the bath and the decorative panel is 5-8 mm (so that the panel can be freely fixed or removed). By means of a level, level the bath. Connect the siphon with sewerage, the sewerage entrance O 50 mm should be situated on the floor level (or not higher than 5 cm above the floor) and not closer than 20 cm from the baths drainage centre. If necessary, use appropriate elbows and elongations. Install the decorative panel, by adjusting the feet of the panel so that the panel is fixed in place. Clean the baths surface with a soft cloth, use liquid sanitary cleaners, if necessary. Do not use abrasive or acidic / alkaline based cleaners! Avoid mechanical damage, such as strong impacts and scratches! Avoid long contact of the baths surface with strongly coloring substances(hair dyes etc.)! Avoid sudden changes in temperature (especially if hot water is produced by a boiler). For example, in winter at low temperature bath should not be quickly filled with boiling water – the bath must be heated gradually.